LAKEVIEW — Subzero temperatures didn't stop dozens of Uncle Fun fans from flocking to the shop on Monday and Tuesday after owner Ted Frankel announced its closure over the weekend. In fact, school closings meant many kids spent the days filling shopping baskets with vintage candy, miniature Coca-Cola bottles and Flintstones fortune tellers at 1338 W. Belmont Ave.
Clay Coutts, 11, and Pilar Kelly, 12, were particularly excited about a pack of bright orange fake parking tickets — a perfect prank for unsuspecting adults in their lives. The two friends were nothing but smiles on Tuesday afternoon, but they initially didn't take the news of the shop's closure well. They've both visited Uncle Fun for every birthday that they can remember. "I heard two days ago, and I was really sad," Clay said. "I was like, we have to go. Immediately." Since the announcement, Frankel has received "lots and lots" of messages with heartfelt wishes, stories of childhood memories and tales about generations of families visiting the shop, he said. He's been surprised by all the positive feedback. Frankel, who admitted to not being tech-savvy, was particularly surprised by the thousands of Facebook notifications he got after posting the news of his retirement. But he's been in Lakeview for a long time, including with now-shuttered shops Fly Paper and Paper Boy. 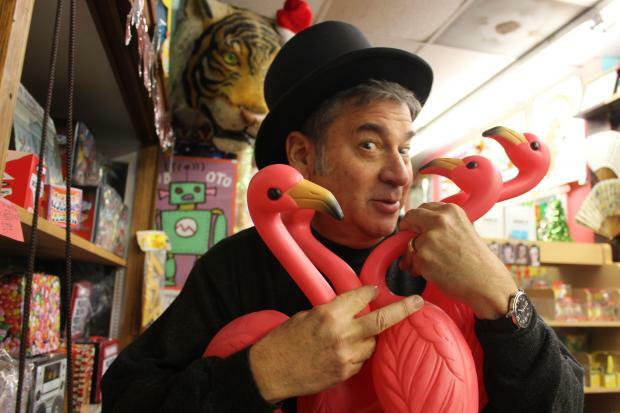 The former graphic designer, 62, has had some form of Uncle Fun in Lakeview for 38 years, bringing knickknacks and unusual gifts to kids and adults alike. Celebrities like Michael Jackson and John Malkovich have stopped by, but they bought the same things everybody else did, he said. His philosophy remains the same to all: Everybody's a kid in Uncle Fun. The store officially closes on Jan. 26. Frankel owns the building and said he does not yet know what he'll do with it. "I want it to be a big party so that everyone who comes in can leave smiling," he said. The Facebook post that attracted so much attention wasn't completely accurate about Frankel's retirement. He's retiring from Uncle Fun, but he'll still be working in Baltimore at Sideshow, an Uncle Fun-like store at the American Visionary Art Museum focused on selling the work of artists without formal training. Frankel's been spending most of his time in Baltimore since Sideshow opened more than nine years ago anyway, only visiting Chicago once every couple months. The move to the East Coast partly has to do with love. Less than a year after Sideshow opened, the museum's founder set Frankel up on a blind date with Bill Gilmore, executive director of Baltimore's Office of Promotion and Arts. Last September, they married in a ceremony performed by Baltimore Mayor Stephanie Rawlings-Blake, no less. But selling Uncle Fun when he moves permanently wasn't an option, Frankel said. "It's my baby," he said. "I didn't want someone to take over. I would just rather let people remember fondly, hopefully, the times they had there." Visitors to Uncle Fun Tuesday afternoon were eager to share those memories. Middle-age women reminisced about stopping at Uncle Fun in their mid-20s after Sunday brunch or for parties. Cindy Barinholtz, who trekked to the store from suburban Morton Grove for years, laughed about how she always walked out with a full bag, a lighter wallet and no idea what she bought, she said. She loved the store so much, she opened her own in St. Joseph, Mich., called State Street Stuff. "This is one of the inspirations," she said. Former employee Brett Neveu, 43, stopped by Tuesday with his wife and daughter to say bye to Frankel. Neveu worked three years for Frankel in early 2000, and he still dreams about the store's many nooks and crannies and tiny drawers, he said. Now a prolific local playwright and a lecturer at Northwestern University, Neveu even wrote a well-received play called "Megacosm" featuring a toy inventor who created miniature living people. It was partly inspired by his time at the store. "There's nothing like Uncle Fun," he said. "It's sort of a cultural touchstone." All that pop culture — toys, figurines, birdhouses, picture frames, books, candy, etc. — is 50 percent off as Frankel aims to clear inventory. The basement is open, too, and every day Frankel will be refreshing the store with items from storage, he said. He said he's only taking a few items over to Sideshow. Sideshow is different from Uncle Fun, but Frankel sees an emotional connection between how he runs the two. "It has a lot of soul in it," he said. "I never really cared about the money. I cared about my customers. It's sort of an old-fashioned idea. It always works. If you don't worry about the money, and you worry about taking care of people and showing them a good time, the money will come."